The NHLPA wrapped two days of Executive Board and Negotiation Committee meetings in New York on Thursday, a meeting that saw 283 Players attend for an update on the on-going collective bargaining negotiations. 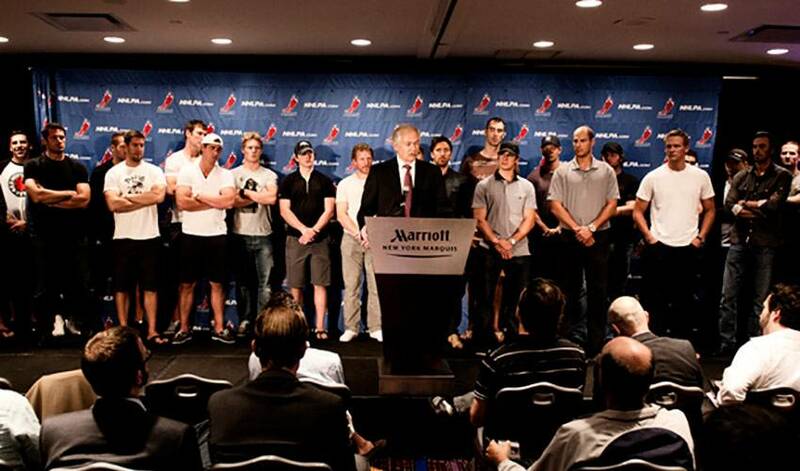 In what is the largest turnout for a non-ratification vote meeting in the history of the NHLPA, the players were able to hear directly from Executive Director Don Fehr as well as other NHLPA staff on the status of the negotiations with the NHL. The players were able to voice their opinions, ask important questions and determine the next steps as the NHL imposed lockout deadline of September 15th quickly approaches. The meetings came in the midst of an extremely busy week, as CBA negotiations resumed between the PA and the league at the NHL’s offices on Wednesday. The NHLPA made another proposal in this bargaining session in an attempt to gain traction ahead of the “deadline”, and also received an offer from the NHL in the same session. The Players’ latest proposal, which includes significant concessions on future salary growth as a means to help the league deal with some of the lower-revenue markets and set the business on a solid footing for the future, as well as adding two years to the initial three-year term the PA proposed resulting in a five-year pact, were dismissed by the NHL and the owners. The meetings reaffirmed the strong sense of unity amongst the membership and allowed the players to catch-up with many teammates and on-ice opponents, as almost half of all current active players were in attendance. With the meetings now concluded, players have begun returning to their home cities or the cities where they play, to continue training, skating and to update teammates who were unable to attend.